LIVESCIENCE AUG 2012 - The first case of skin cancer in a wild marine fish population looks eerily similar to the melanoma that plagues humans, researchers report 1-8-12. Coral trout living on Australia's Great Barrier Reef are directly beneath the Antarctic ozone hole, the world's largest, which is the result of the depletion of ozone in the atmosphere that normally protects humans from harmful UV rays. The diseased fish were caught around Heron Island and One Tree Island. Cancer can be triggered in any animal by exposure to carcinogens in the environment we live in and in the food that is eaten. That is bad enough, but if you are swimming about in an environment that is laden with PCBs and POPs you are sure to be in for a rough ride eventually from the constant bombardment of chemicals. Plastic in the ocean acts like a sponge soaking up and concentrating carcinogens that is then eaten by marine animals and passed up the food chain to humans. At this time the concentrations in fish are considered by some not to be at harmful levels for humans. From the mounting body of evidence we have seen we have our doubts and say why would you want to take the chance? You only have one life and so do the animals that you are guardians of and depend on us. How the polychlorinated biphenyl's and other persistent organic pollutants got into the sea is something to look at in greater detail on other pages where we are interested in ocean regeneration. Hence, the causes of pollution are something to look at by way of prevention rather than cure. We do though need to think on how we can remove these nasties from our oceans and give marine life - and so ourselves - a better chance of living a disease free life. For we are at the top of the food chain and depend on marine life for our survival. GLOBAL WASTE PROBLEM - The above views of planet earth as global views show us the Atlantic, Indian and Pacific ocean gyres and estimates of plastic waste in (thousands) numbers of pieces of plastic waste per square kilometer of sea. The Pacific Ocean gyres are held to be the worst at the moment. These gyres contain some of the most concentrated carcinogens you are likely to come across in the sea. The problem is that giant swirls of toxin laden plastic soup called gyres are revolving in all our major oceans that are so large it is difficult to know where to begin - so nobody has - and that is the bad news. The good news if there is such a thing, is that as a charity, the Cleaner Ocean Foundation has come into existence to look into the possibility of reducing the carcinogens that are in our ocean. A group of engineers and volunteers got together in 2015 to come up with the SeaVax concept, a vessel that is designed to capture plastic in many forms, but especially micro and macro plastics. Microplastics concentrate carcinogens and trap them like a sponge. If the object of a mission is to remove toxins from seawater, then by removing the small particles of plastic, the carcinogens that have been trapped in the plastic will be removed from the ocean environment, potentially regenerating the marine setting, ultimately to the benefit of all life on earth. Healthy fish are extremely nutritious and we should do what we can to keep it that way. Any given serving of fish is packed with protein, and contains B vitamins and minerals including potassium and selenium. One serving (3-ounces) contains from 80 (lean fish like cod) to 150 calories (fattier fish, like salmon). Higher fat fishes with their omega-3 fatty acids are the ones most linked to heart health benefits. Omega-3 fats are found in fish like salmon, mackerel, herring, lake and rainbow trout, sardines and albacore tuna. Unfortunately, almost all fish and shellfish today come with at least some contaminants, accumulated in waters with pollutants and pesticides. FIDDLING WHILE ROME BURNS - This is not a message from us but another group that was concerned with the Fukushima incident and the cancer in fish that came about as a result. But, one could argue that ignorance of what is happening in our oceans is one of the main reasons why it is happening - why plastic is being dumped in the sea and nobody seems to care. Fishes develop tumors and cancers, much like humans and other animals. Most tumors are seen as bumps or lumps under the fish's skin. But the location and signs of the tumor can be different for each fish, and depend greatly on the type of tumor. Internal tumors or cancers display symptoms once the fish is almost gone. The fish’s ability to eat and swim will be affected, causing a rapid decline in its health so that a fish with an obvious display of cancer is less likely to be seen in wild fish catches. Ornamental Koi fishes usually get tumors in the reproductive organs. They will have swollen abdomens and the illness can become terminal. Conversely, goldfish are susceptible to fibroma tumors and sarcoma cancers. While Gypsy-swordtail fishes, generally develop skin cancer (malignant melanoma). Another type of tumor is found in the gills. It causes the fish to be unable to close its gills, and is due to a thyroid dysfunction. As pets, owners know about these fish issues, as consumers we know very little and expect that fish sold in our supermarkets is healthy. But is it? The longer a fish lives, the more it will store up and concentrate toxins for humans at the top of the food chain. It is well known that pregnant women should steer clear of sharks and swordfish because of high mercury levels. Acid oceans, pollution and a hole in the ozone layer above Australia appears to be a recipe for skin cancer in fish. FISH WITH CANCER - Pollution from nuclear power plants in any shape or size is unthinkable. We must stop using nuclear energy for anything that can harm the marine environment, including nuclear reactors for aircraft carriers and submarines. In March, 2011 an earthquake off the coast of Japan caused a Tsunami which hit the Fukushima Nuclear Power Plant, causing three reactors to melt down. Not only has that disaster site been spewing 400 tons of highly radioactive water into the Pacific Ocean every day since the earthquake for quite a time. The radiation reached the US West Coast and the fish that were being eaten at that time from the Pacific ocean were disease ridden. 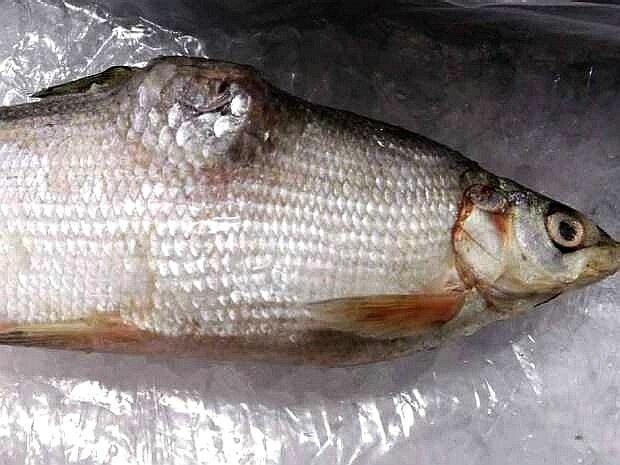 The radiation in the fish was so terrible that wild-caught Alaskan Salmon and Canadian white fish were being found to have bloody, cancerous, tumors throughout their bodies. If the strange lesions and cancerous tumors were only affecting Salmon, one might theorize that a particular disease had struck a particular species. That’s not the case as Alberta Pike are also being caught with grotesque cancerous tumors protruding outside their bodies. If anything the radioactive pollution from Japan shows us that fish are highly susceptible to changes in their environment and that plastic pollution is likely to cause us major problems if we do nothing. Americans and Canadians have been eating radioactive fish filled with bloody, cancerous tumors as a result of fish being contaminated with huge amounts of radiation in the Pacific ocean from the Fukushima nuclear disaster in Japan. In March, 2011 an earthquake off the coast of Japan caused a Tsunami which hit the Fukushima Nuclear Power Plant, causing three reactors to melt down. 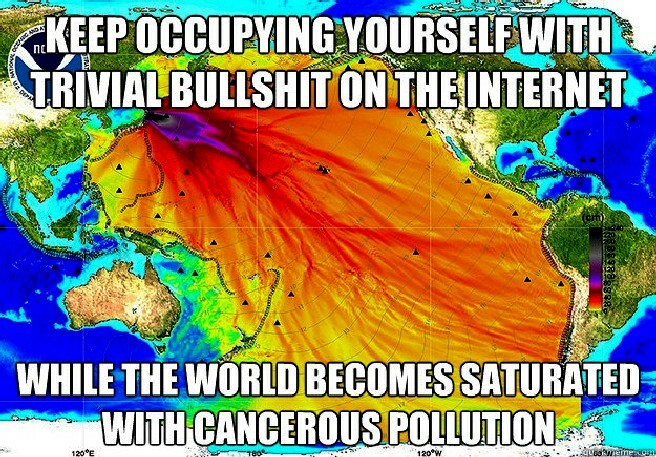 Not only has that disaster site been spewing 400 tons of highly radioactive water into the Pacific Ocean every single day since the earthquake, the radiation has reached the US West Coast and the fish you've been eating from the Pacific ocean are full of it! The radiation in the fish is so terrible that wild-caught Alaskan Salmon and Canadian white fish are being found to have bloody, cancerous, tumors throughout their bodies. According to the Local Environmental Observers (LEO) Network in Hydaburg, Alaska, they have found strange growths in the flesh or meat of salmon. "We were fishing for cohos (silver salmon) at the mouth of the Hydaburg River with line and reel." said Brian Holter, Jr. who said that eight fish were filled up inside with strange growths that were either white or pink in color. "On the outside the fish looked fine. The growths looked kind of like individual little salmon eggs, and about the same size. There people were seeing the same kind of growths in their fish as well." he continued. The map below will give readers an understanding of the proximity of Hydaburg, Alaska to the Fukushima, Japan disaster site to demonstrate how far the effects of Fukushima radiation has traveled in the three years since the disaster began. Sadly, the images above aren't nearly the worst of it. Other fishermen and even Marine Biologists have caught other fish showing classic signs of radiation-caused cancerous tumors. "In all the years I’ve been fishing I never caught any fish like this. 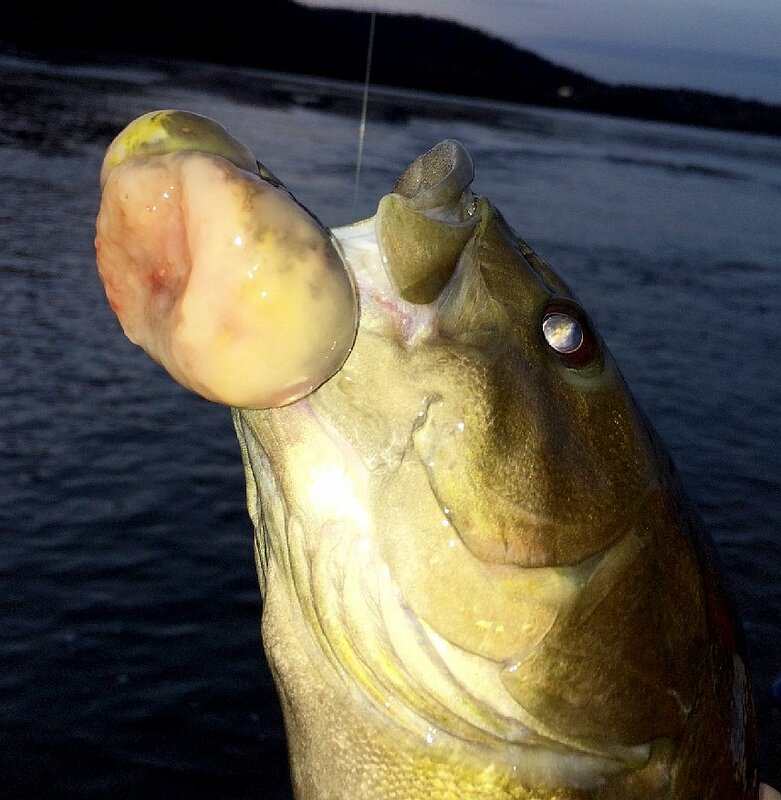 Caught 3 more sick fish with same markings and this time one had some kind of growths coming out from its mouth Most people in our community eat this fish." Sam Kunaknana continued. For three years, the Fukushima Nuclear Power Plant disaster has been spewing deadly radioactive material into the Pacific Ocean and for three years, the agencies above have done nothing. It was widely believed that sharks did not suffer from cancer. But that myth was put to bed after the Fukushima disaster in 2011. Well, when they swim around the Pacific Ocean in radiation even sharks get cancer. Researchers in Australia noticed a large tumor protruding from the mouth of a great white shark, as well as another mass on the head of a bronze whaler shark. The great white’s tumor measured 1 foot (30 centimeters) long and 1 foot wide, according to a study describing the tumors published online in November in the Journal of Fish Diseases. “This was a very unusual sight as we have never before seen a white shark with tumors,” said Rachel Robbins, a study co-author and shark biologist at the Fox Shark Research Foundation, near Adelaide, in southern Australia. 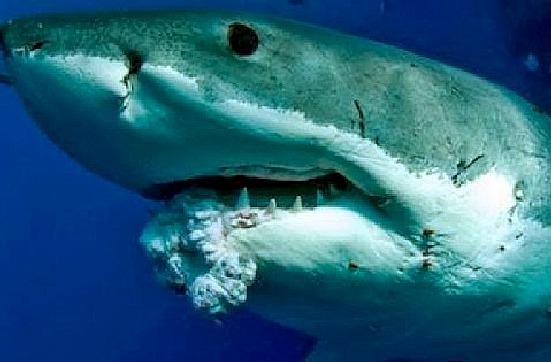 Behold, the first photo in the history of human existence, showing a Great White Shark with a cancerous tumor on its mouth. Scientists have known for more than 150 years that sharks get cancer. And yet the belief persists that the animals don't suffer from the disease. That misconception is promoted in part by those who sell shark cartilage, who claim that the substance will help cure cancer, said David Shiffman, a shark researcher and doctoral student at the University of Miami. But no studies have shown that shark cartilage is an effective treatment, and the demand for the material has helped decimate shark populations, researchers say: Humans kill about 100 million sharks per year, according to a March 2013 study (although many factors contribute to the killing of sharks, including demand for shark-fin soup). Recently, researchers in Australia noticed a large tumor protruding from the mouth of a great white shark, as well as another mass on the head of a bronze whaler shark. The great white's tumor measured 1 foot (30 centimeters) long and 1 foot wide, according to a study describing the tumors published online in November in the Journal of Fish Diseases. "This was a very unusual sight as we have never before seen a [great] white shark with tumors," said Rachel Robbins, a study co-author and shark biologist at the Fox Shark Research Foundation, near Adelaide, in southern Australia. In total, scientists have now documented tumors in at least 23 species of sharks, including the two in the new study, Robbins said. "The main take-home message from the study is that it adds to the growing evidence of tumor formation in sharks, contrary to popular belief that sharks do not suffer from such anomalies," Robbins told LiveScience. "Sharks get cancer," said Shiffman, who wasn't involved in the study. "Even if they didn't get cancer, eating shark products won't cure cancer any more than me eating Michael Jordan would make me better at basketball." The belief that shark cartilage can treat cancer diverts patients from effective treatments, according to a 2004 review in the journal Cancer Research. The demand for cartilage also fuels widespread fishing for sharks. One in six known species of sharks, rays and skates are considered threatened with extinction by the International Union for Conservation of Nature, an environmental group, Shiffman said. It's unknown what caused the tumors in the great white or bronzer shark. However, reports of cancerous tumors in marine animals, especially mammals, have steadily increased over the past 20 years, raising concerns that industrial pollutants or human activities may trigger the cancers, according to the study. Beluga whales have been recorded to suffer from cancer, and in areas near aluminum smelting plants, cancer is the second leading killer of the whales, the study noted. 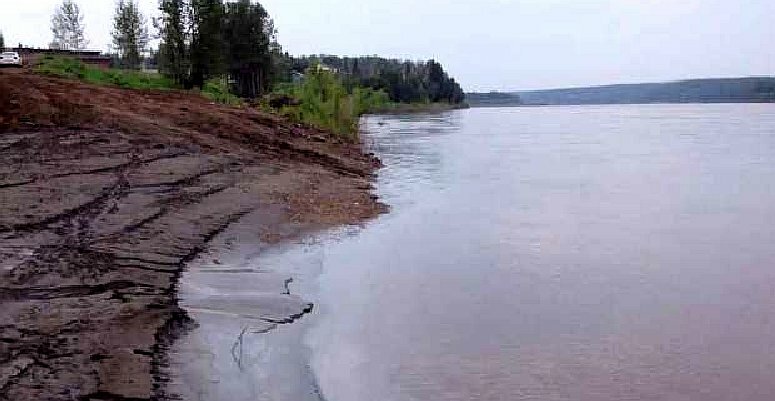 EDMONTON - The University of Manitoba study linked 23 cases of cancer in 94 people in Fort Chipewyan to high levels of contaminants in the fish and animals consumed by residents. Pollution in the oil sands have been linked to elevated cancer rates in Fort Chipewyan for the first time. Conducted in collaboration with the Athabasca Chipewyan and Mikisew Cree First Nations, the University of Manitoba study found fish and animals consumed as part of a traditional diet contained unusually high concentrations of contaminants emitted during the extraction and upgrading of bitumen. Twenty-three cases of cancer were reported among 94 people interviewed as part of the three-year, $1-million study, which was partially paid for by Health Canada and peer-reviewed by its scientists. Alberta Health Minister Fred Horne said the province had not seen the report, but would review its findings. “The thing I would say, and I want to emphasize, is that as health minister I really sympathize with any community concerned about the health of its members, and I’ve expressed that to the chief,” Horne said. Samples taken from beavers, ducks, fish, moose and muskrats contained high concentrations of carcinogenic polycyclic aromatic hydrocarbons and levels of arsenic, mercury, cadmium and selenium high enough to be of danger to young children. “Many of the results, as they relate to human health, are alarming,” McLachlan said. “It should function as a wake-up call to industry, government and communities alike. For years, residents in Fort Chipewyan have asked government to look for potential links between industrial development and health issues to no avail. Updated statistics released in March by the Alberta Cancer Board confirmed clusters of rare bile duct cancer and cervical cancer in the community, 300 kilometres north of Fort McMurray. Linda Duncan, the member of Parliament for Edmonton-Strathcona, joined provincial NDP MLA Rachel Notley in demanding some sort of government intervention. The study recommended government undertake a comprehensive analysis. Greg Stringham, the vice-president of the Canadian Association of Petroleum Producers, pointed out that one previous study failed to find a connection between the oil sands and elevated cancer rates, but welcomed the new data. “Industry is really supportive of any information that leads to the body of evidence,” Stringham said. If you're eating more fish for dinner, you may be eating less red and processed meats, which increase colorectal cancer risk. Fish is a staple of several dietary patterns also linked to lower cancer risk, such as the Mediterranean diet. People eating a Mediterranean diet are also eating plenty of beans, whole grains, vegetables and other plant foods, which all play a role in reducing cancer risk. These healthy fish-containing dietary patterns are also low on sugary foods and drinks and refined grains. Taken together, these diets high in plant foods, moderate in fish and seafood and low in sugar can help people stay a healthy weight. An acid body is a magnet for sickness, disease and aging. Eating more alkaline foods helps balance your body's pH, feeds the cells their necessary nutritional requirements and aids in keeping the cells at a healthy oxygen level. A focus on primarily alkaline food and drink thus aids in preventing and combating illness and disease. Overabundance of acid foods cause sickness, disease and aging. Healthy cells are alkaline. Unhealthy cells are acidic. pH Balance: The pH scale is from 0 to 14, with numbers below 7 acidic (low on oxygen) and numbers above 7 alkaline. The blood, lymph and cerebral spinal fluid in the human body are designed to be slightly alkaline at a pH of 7.4. At a pH slightly above 7.4 malignant cells become dormant and at pH 8.5 they die, whilst healthy cells live on. Taking medicines or supplements for cancer while your pH is highly acidic is a bit like washing dishes in a sink of dirty water - even when you put in plenty of soap, you can't get the dishes clean. Imagine now that you live in an acid ocean. Imagine that you are a fish under attack from humans and you can do nothing about it except be caught and eaten - and pass on all of that carelessness to the perpetrators of the crime. Polluting our oceans is a criminal offence under the Marine Pollution Acts (MARPOL). In general, degenerative diseases are the result of acid waste buildups within us. When we are born, we have the highest alkaline mineral concentration and also the highest body pH. From that point on, the normal process of life is to gradually acidify us. That is why these degenerative diseases do not occur when you are young. 1. The first step is to lower the acidity of the body so that it can dispose of acidic wastes in the blood and cellular fluids safely and easily. 2. The second step is to physically pull out old stored wastes into the blood stream so that they can be discharged from the body. 1. Stop putting waste in the ocean. 2. Gradually draw the accumulated waste out of the ocean. THE INDEPENDENT FEB 2015 - The world’s oceans are being filled with enough plastic waste to thickly line every coastline in the world, according to the first detailed global assessment of the problem. Scientists estimate that about 8 million tons of plastic debris such as food packaging and plastic bottles are being washed into the oceans each year – and the cumulative quantity of waste will result in a tenfold increase in the total amount of plastic in the sea by 2020.